A Great Tool for Lighting Designers!!! 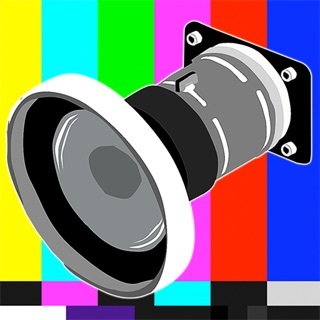 This app is an extremely valuable tool for lighting designers. It is useful both in preproduction and on site. 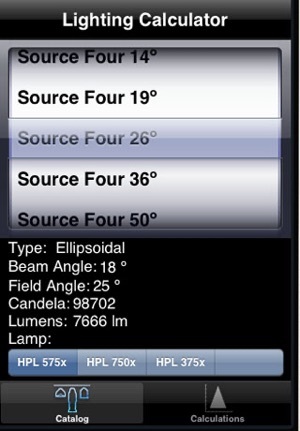 This app quickly calculates data for a multitude of popular lighting fixtures. It has a clear and concise interface that took me only seconds to grasp. Not only is it a time saver, but the fact that it stays in your pocket, allows you to make quick accurate design decisions on the spot. Light Calc is a must for lighting designers. Well worth the price. Nice work. This is the perfect example of the App Store doing what it was designed for: creating cheap, well made, and obscenely specialized applications. I noticed a few reviewers gave this app a poor score because it was "useless" or something along those lines. Ignore these people, as they obviously know nothing about lighting. For anyone who has ever had to light design, trust me when I say that this app is an invaluable replacement for long, tiring calculations by hand. After trusting this program for a few years I stumbled upon some huge inaccuracies. 50 deg Source 4s listed as having higher FC output than a 19deg for the same throw and wattage, and suddenly I noticed many other such problems. I emailed the developer and got zero response. The program is almost 6 years old. Don't keep filling their coffers until they fix these problems, update their catalog, and hire a support person. And don't trust the results you get from their app.